The Silver Spring, Maryland, man — a self-proclaimed white nationalist who was found to possess 17 firearms and what appeared to be a hit list of prominent liberal politicians and media figures — has been held without bail since his arrest on Feb. 15. At his first court appearance last Thursday, U.S. Magistrate Judge Charles Day said he would keep Hasson in prison, but would revisit the decision in two weeks if prosecutors don’t bring more serious charges by then. So far, Hasson hasn’t been charged with any domestic terrorism-related offenses. Prosecutors have until March 7 to bring more serious charges. Court documents reveal Hasson harbored extremist views for years. An email drafted by Hasson and recovered by authorities described his desire to “kill almost every last person on earth,” using biological attacks such as anthrax or botulism, along with attacks on food supplies. According to court documents, Hasson studied the manifesto written by Norwegian mass murderer Anders Behring Breivik. Breivik, a right-wing extremist, is serving 21 years for killing 77 people in a 2011 bomb-and-shooting rampage in Norway. Court documents said the manifesto instructs would-be attackers to collect weapons, disguises, food and survival tools. 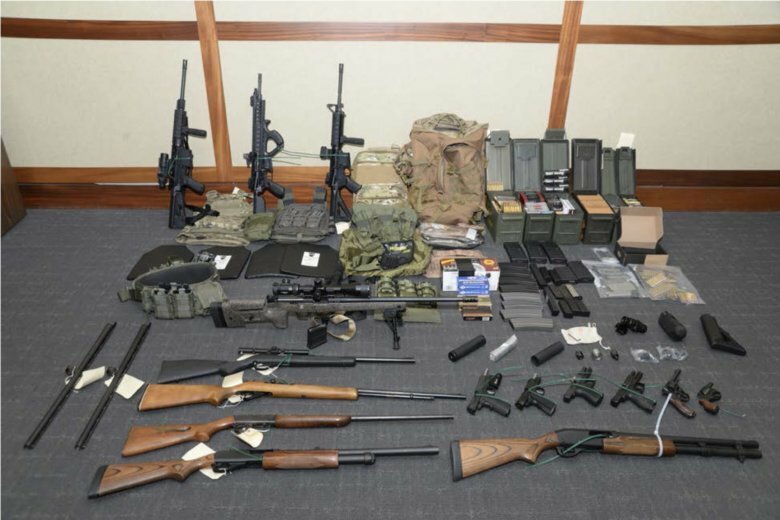 When police executed a search warrant at Hasson’s residence, they recovered seven rifles, two shotguns, four pistols, two revolvers, an assembled firearm silencer and a disassembled firearm silencer. They also found tramadol, which is classified by the Drug Enforcement Administration as an opioid analgesic. If convicted on current charges, Hasson could face a maximum of 10 years in prison for each of the three charges related to the weapons and a maximum of one year for possession of tramadol.